If Apple becomes Microsoft, investors should cheer. At least, that is, for their wallets. Middle age for technology stocks can hurt as shareholders looking for rapid growth lose interest and value-oriented owners await stability. But Apple has already made the transition – before its growth has slowed much. Even if its next decade echoes Microsoft’s last, the company is worth over $1 trillion. First, consider Microsoft, worth $220 billion as of Friday’s market close. The software behemoth churns out more than twice as much profit as it did a decade ago. The company traded at 30 times estimated earnings in 2002. As investors realized its future was more Clark Kent than Superman, they paid less and less for the prospect of future expansion. Annual percentage revenue increases of late have at best been in single digits. Strip out its $67 billion of cash, and the business trades at about 6.5 times estimated earnings, according to Thomson Reuters. Now look at Apple. In the fiscal year to September, its top line surged 45 percent. That was less than the year before, and there are reasons to expect a more pedestrian future: the company lost part of its creative soul when Steve Jobs died in October 2011; it’s a big ask for Apple to come up with another product like the iPod, iPhone or iPad; and competition in mobile devices is becoming tough. But analysts still expect revenue to increase 24 percent this year. And after taking out Apple’s whopping $121 billion cash pile, the underlying business on Friday traded at a price-to-expected earnings ratio of some 7.9 times, scarcely richer than Microsoft’s. Suppose Apple Chief Executive Tim Cook turns out to match his Microsoft counterpart Steve Ballmer, and that Apple’s earnings increase at an 8 percent annual rate for the next 10 years, roughly what Ballmer has coaxed out of Microsoft since 2002. Apple’s profit would then be about $90 billion in 2022. On the software company’s multiple, that would make Apple’s business, excluding cash, worth $585 billion. Start with last fiscal year’s cash accumulation of about $40 billion and assume the same rate of growth, and in a decade the company will have added another $625 billion to its cash pile or to dividends. Add back all the cash, and the iPhone maker would be worth $1.3 trillion – approaching three times more than now, or a 10 percent annual gain. Of course, the technology industry is littered with fallen tech giants. Competition, for instance, could depress Apple’s margins, though in fact they have widened in recent years – and Microsoft’s have held up. But if Apple turning into a sluggish Microsoft lookalike is all that it takes to more than double investors’ money, that seems a safe bet. 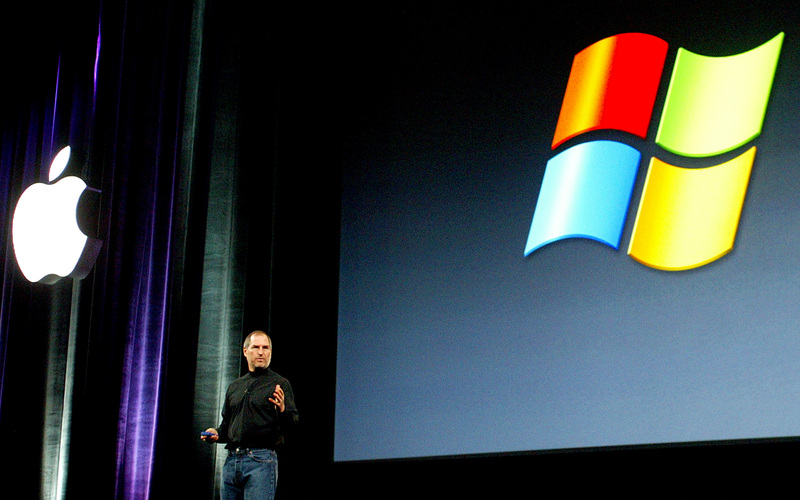 Apple CEO Steve Jobs stands between logos of his company and that of Microsoft windows as he delivers his Apple Expo Keynote speech in Paris on September 10, 2002. Apple’s shares fell 24 percent over the two months to Nov. 16, closing at $527.68. They were trading some 6 percent higher soon after noon in New York on Nov. 19.